WAFFLES: TAG! You're it, Boss! KATIE: Tag, I'm what, Waffles? WAFFLES: It, Boss. You're it. KATIE: You're touching me, Waffles. WAFFLES: No, Boss. I'm tagging you. KATIE: Tagging doesn't sound any better than touching. And what have I told you about touching? 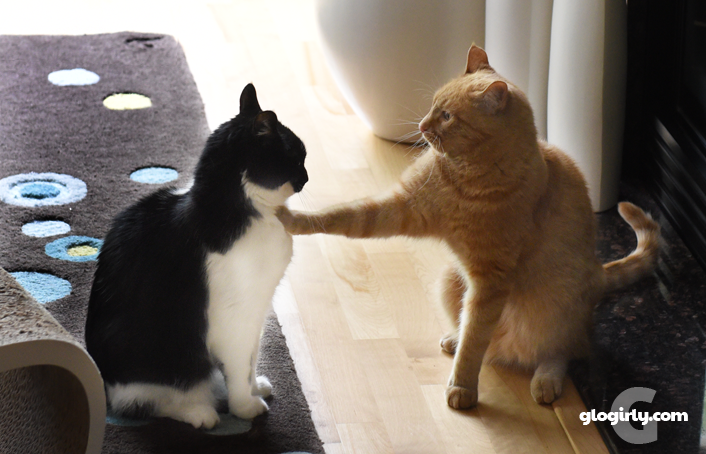 WAFFLES: What have you told me about touching? KATIE: That's what I said. What have I told you about touching? WAFFLES: No, I'm asking. What have you told me about touching? WAFFLES: Ok, so if touching is out and tagging is out. How about tickling? KATIE: You did not just ask me that. 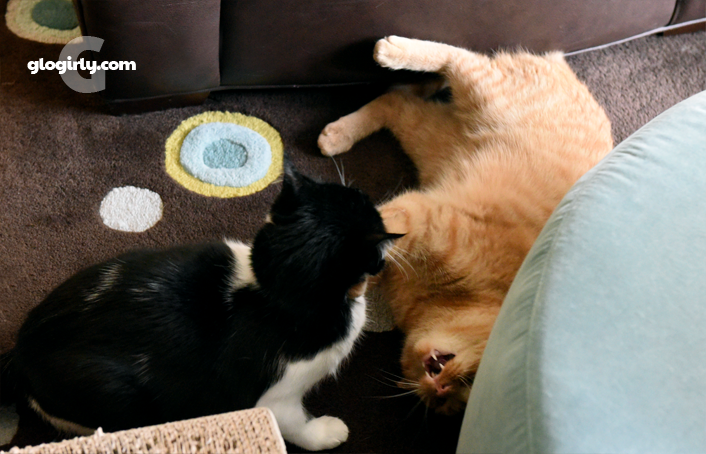 WAFFLES: TICKLE FIGHT! TICKLE FIGHT! It's no secret that Katie and Waffles have what can only be described as a complicated relationship. Often their encounters end in a huff and a hiss with one or the other storming off. Occasionally, Glogirly has to play referee. But lately, they've been caught doing something we never thought we'd see. Playing. 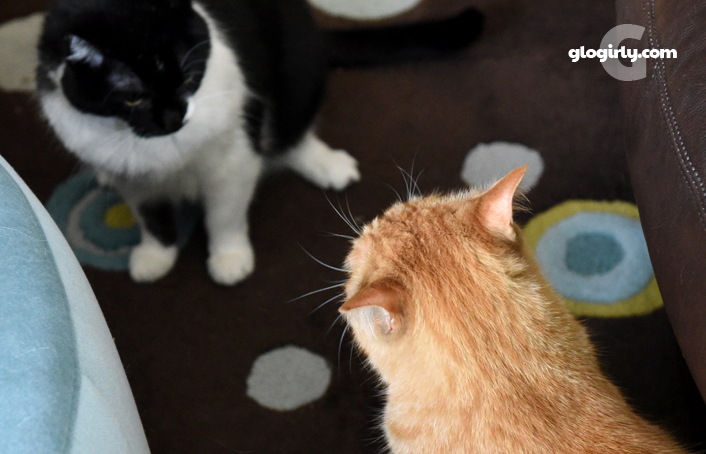 Or at least as close to playing as two cats like Katie and Waffles can get. Just this past weekend, Glogirly glanced over to the other side of the kitchen and saw what she thought was a fight brewing. 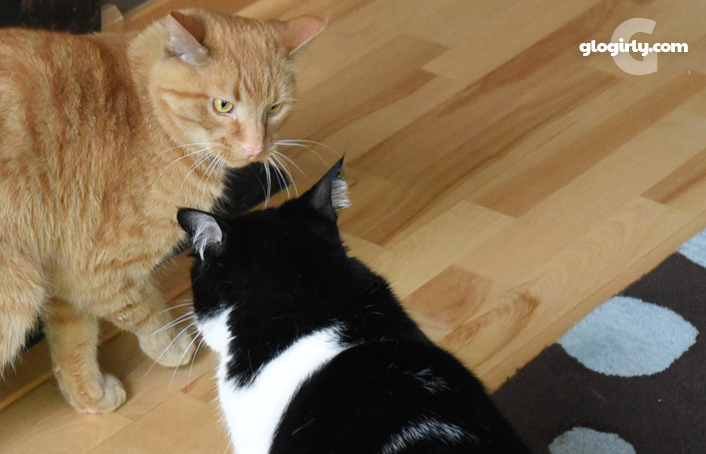 Sure enough, Katie and Waffles were batting back and forth, patty cake style and then tumbling around on the floor. A little chase here, a little chase there. But vocally, they were silent. None of the usual hissing. Not even a faint growl. It was as if they were actually having fun. Could it be the two are finally letting their guard down? What's next? Grooming and napping together? ...uh, probably not. Hey, if Binga can be my friend, Katie and Waffles can be too! For the record, though, Binga and I do not sleep together. That would be TOO much togetherness. I'll get in a tickle fight wif ya! Oh wow! We're speechless!!!! Now Katie must go on the BlogPaws trip so we see what happens!!! It has taken a long time, but maybe they've found some mutual respect. Their body language makes their tussle look more even-sided than the ones between Newton and Pierre usually are, too. And here it's just the opposite. Is Mercury in retrograde??? Maybe you two have set a truce?! Reminds me of my Garfield and Hope. Only Hope does the touching. LOL. Have a great week. Progress! MOL! Their relationship sounds a lot like Delilah and Caster's. They love to give each other a hard time. Annabelle loves to run after Ping. He is 3X her size but I think she is 3X more energetic! So I guess it evens out. She so wants to play but the old geezers don't like to play much, at least not with her. So I can relate to the youthful Waffles! I'm glad to hear that they are getting to the point where they will play together. Cinco and Manna have a very similar relationship. They aren't all buddy-buddy like some cats, but they tolerate each other and they play together occasionally. You guys were playing Patty Cake together?!? That's awesome. Katie ... admit it - you LOVE Waffles!!! Are you mellowing Katie, or will it be daggers at dawn tomorrow? And to think..it only took two and a half years..lol..
Did Henry Kissinger visit for some peace talks? Mum says she is dating herself with that reference! Well, a cat probably fare better tickle-fighting another cat than a human would. Running out of Neosporin.